Services for Steven Raap will be 11:00am Saturday February 16, 2019 with visitation beginning at 10am prior to services at the funeral home. Spring burial will be at the Andover Cemetery. Steven Courtney Raap was born September 25, 1947 to Harry C. and Lucy (Mielke) Raap at Aberdeen, SD; the youngest of ten children. He was baptized into the Lutheran faith and attended school in Andover. Steven grew up on the family farm where he enjoyed riding his bike, mowing the lawn, listening to his radio, going for rides and visiting with neighbors. He always had a smile and a hand wave for people he met. He has lived in Yankton, SD for the past 37 years. He loved farm magazines and spent many hours cutting out pictures of John Deere machinery. The Christmas lights at Falls Park and watching for deer were also special times for him. 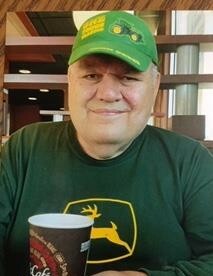 Eating out was a highlight; he loved anything related to John Deere, wearing black jeans, and having money in his wallet. We would like to thank the staff at Ability Building Services in Yankton for the loving support shown to Steven; and also thank you to the Sister James Care Center and Hospice Care Staff for the special care given him. Survivors include sisters: Pat Lackey, Federal, AR; Joan VanDyke; Kay (Lyle) Kranzler, Sioux Falls, SD: Laurel (Robert) Kost, Fort Collins,CO; Allana (Frank) Novotny, Wisner NE; brothers: Chuck (LaVonne), Groton, SD; Jerry (Carol), Andover, SD; Tom Raap, Sioux Falls, SD; sister-in law, Jan Raap, Groton, SD; and several nieces, nephews, and friends. He was preceded in death by his father in 1965, his mother in 1995, his brother, Bert and sister-in-law, Darlene; brothers-in-law, Ray Lackey, and John VanDyke.